(Kelly Lehr) Members of the Lil’ Pucks play against The Guardians of the Goal-axy in Boulder City Parks and Recreation Department's youth hockey league, which began Saturday, Jan. 26, 2019. Floor hockey has begun at the Boulder City Parks and Recreation Department. 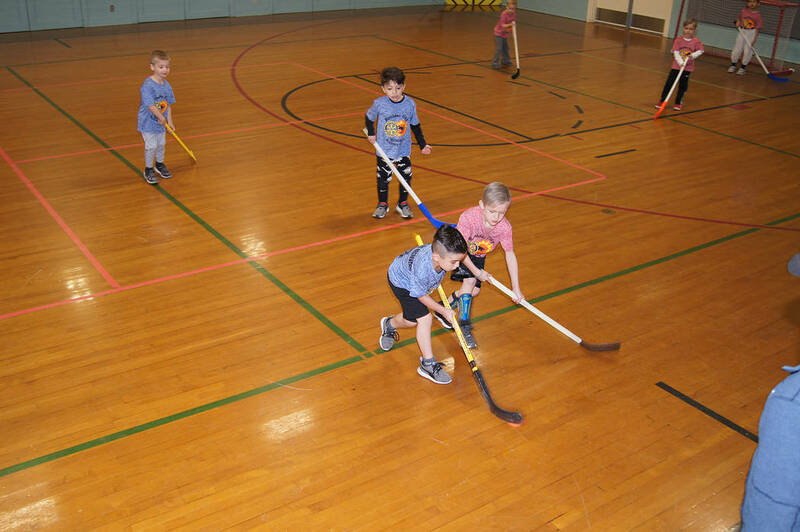 The 2019 kindergarten through second-grade floor hockey season began Saturday, Jan. 26, with opening ceremonies led by Boys Scout Pack 30, Troop 7, and honoring this year’s sponsor: Boulder City Sunrise Rotary Club. Tom Novatney, a past Rotary district governor, attended along with Jeff Breeden, president of Boulder City Sunrise Rotary, Cyndi Anderson, president-elect, and club members in red shirts. City Councilwoman Peggy Leavitt came to show her support as well, said Kelly Lehr, sports coordinator for the department. The league has 10 teams — four kindergarten and six first- through second-grade teams. Games begin at 9 a.m. every Saturday in the old gymnasium and will be played through mid-March. The third- through sixth-grade hockey clinic will be held at 9 and 10 a.m. Feb. 16 in the new gymnasium. Games will begin in mid-March and be played on Monday and Wednesday evenings through April.